This is individual building at edge of the Zemun, close to bus turntable and Zemun-Borca bridge. It is in only couple of minutes driving distance from highway and it has very good traffic connection with city. Premises occupies two levels of 110 m2 each. 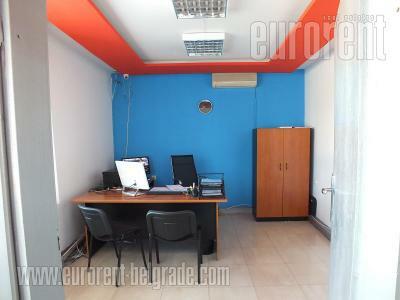 Ground floor can be used as storage space or exibit space, with rolling doors, one small office and toilet. Floors are covered with ceramic tiles. Upper level has four offices, three of which are smaller and one large office. Tehnical equippment include installed computer network, internet connection and air conditioning. Four parking spots are at disposal to future users. Premises is suitable for different purposes.